Beijing on Thursday blamed “reckless” local officials for sparking a massive protest against the demolition of a large mosque in the city of Weizhou. Communist officials insisted the situation is “under control” and local Muslims are now in a “good mood,” but they never quite got around to clarifying whether the mosque will indeed be demolished. Weizhou is located not in Xinjiang province, whose Uighur Muslims have been the focus of growing international concern lately, but in the Ningxia region, where the roughly equivalent population of Muslims belongs to a less well-known and almost completely Chinese ethnicity called the Hui. The Hui are generally much more comfortable with the government in Beijing than the Turkic Uighurs and are treated with a considerably lighter touch. Reasons commonly cited for the success of Hui assimilation into Chinese society include their lack of religious focus—they follow several different branches of Islam—and their disinterest in separatism, plus the simple fact that the Hui look more Chinese than the Uighurs. The Hui protest in early August, therefore, came as a surprise. 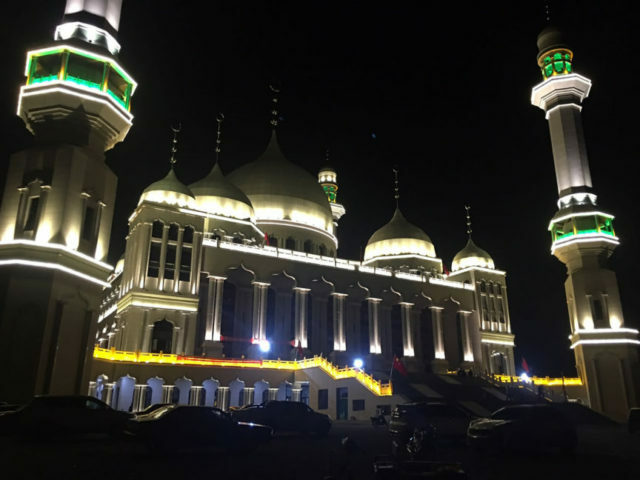 A large mosque was constructed in Weizhou last year, but local officials abruptly declared it was constructed without the proper permits and must be torn down. Several thousand Hui Muslims assembled outside the mosque to express their displeasure with this idea—a public demonstration of resistance on a scale almost unheard of in China. The protesters were described as stunned and frightened by the mosque demolition order. Some of them ominously stated they simply would not allow Chinese officials to harm the structure. Others worried the Hui were finally feeling the heat from Communist China’s general crackdown on organized religion, which the Party wishes to “Sinicize” and firmly establish as subordinate to Communist authority. Hui worried about this “Sinicization” process were not mollified when Weizhou officials tried moderating their position by saying they merely wished to remodel the mosque to make it look more Chinese. In other words, they proposed knocking down the minarets and replacing them with pagodas. “Changing it to a traditional Chinese style is as incongruous as putting the mouth of a horse on the head of an ox,” a local man retorted. “Local people are satisfied with our explanation, contrary to what was reported by many media. They are in a good mood now and live a normal and peaceful life,” the governor insisted. This good mood has allegedly been restored despite the fate of the mosque remaining unsettled. Bai blithely insisted the mosque is “different than others” and its “legality is controversial,” which suggests the permits are still a problem and the extreme pagoda makeover is still on the table.